Washington (CNN) - Americans feel sadness, anger and shock in the wake of the tragic events in Tucson, Arizona, according to a new national poll. A CNN/Opinion Research Corporation survey released Monday also indicates there's plenty of blame to go around over the shootings, but two-thirds of the public is pessimistic that the government or society can prevent something like this from happening again. 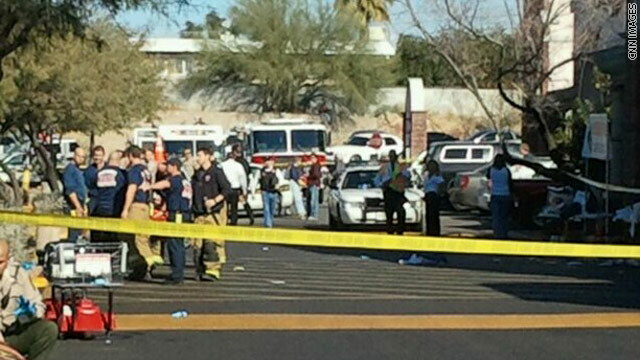 A total of 19 people were shot January 8 at the "Congress on Your Corner" event at a Tucson supermarket. Authorities believe Rep. Gabrielle Giffords was the target of the mass shooting that left six dead and another 13 wounded. Giffords was upgraded from critical to serious condition Sunday, eight days after being shot in the head at the public event. A 22-year-old suspect, Jared Lee Loughner, is in custody. Ninety-three percent of people questioned in the poll say that they personally felt sadness in response to the shootings, with just over seven in ten saying they personally felt anger, and two thirds saying they felt shock. Only 32 percent said fear was an emotion they experienced in response to the shootings. The survey indicates that while a majority of Americans say that current gun laws deserve a great deal or a moderate amount of blame for the shootings in Arizona, seven in ten say that the incident does not make them more likely to support stricter gun control laws. "That may not be surprising given the widespread pessimism that government can do anything to prevent an incident like this from happening again," said CNN Polling Director Keating Holland. "Two-thirds say that shootings like the one in Arizona will happen again regardless of any action taken by the government or society." According to the survey, just under half also blame the harsh rhetoric and violent metaphors used by politicians and commentators as a contributing factor behind the shootings, and 54 percent believe that harsh political rhetoric may lead to other shootings in the future. "But while a large majority predict that tragedy in Tucson will lead to more civility in political debates, only one in ten think that change will be permanent," adds Holland. "Seven in ten say politicians will tone it down in the short run but the change won't last very long, and 18 percent think there will be no change at all." Seven out of ten blame the resources available to deal with people who may be mentally ill as a contributing factor to the shooting. According to the poll, the public doesn't blame Sarah Palin's website for the incident in Arizona. Only a third of all Americans say that the website – which had an image that looked like the crosshairs of a gun marking Gifford's congressional district – deserves a great deal or a moderate amount of blame. The former Alaska governor put the website up last year during the debate over health care reform, to highlight 20 congressional districts won by Sen. John McCain in the 2008 presidential election, where Democratic representatives were voting in favor of the legislation. The survey also indicates that Americans are divided on Loughner's punishment if he is found guilty in this case, with a small majority favoring the death penalty and 43 percent opting for life in prison with no chance of parole. The CNN/Opinion Research Corporation poll was conducted January 14-16, with 1,014 adult Americans questioned by telephone. The survey's overall sampling error is plus or minus 3 percentage points. Oh dear.....all the right wing hate spewers telling people to go shoot liberals, don't have anything to do with the fact that the right wing crazies are out gunning for liberals. gee I sure would like to see all the stories where liberals are running around with guns trying to shoot republicans. Or by the way where are the liberals trying to blow up a representatives house you know like the way the right wing blow hards told their "subjects" in Virginia to go after the liberals who voted for the health care bill. You can't find any stories because the Democrats are sane and responsible, they are not dumb and stupid enough to have their mind brainwashed by the likes of Palin, Beck, Rush, Malkin, and Bachmann. Let's be honest here..of course this was a tragic situation but it became a bigger deal because of the Congresswoman being shot. We have had nutjobs in our nation for years go in and shoot up places and it gets front page news for a few days, the left comes out and wants more gun control, the right says no and then life goes on. The finger pointing will go on for a few more days on talk radio but nothing is going to change I'm afraid to prevent the next mass shooting. Some one was quoted as saying "This is NOT America", well sorry to disagree but it IS America be cause it happens here too often. Palin has guilt indeed – that is why she immediately pulled her Map w CrossHairs to "target" our Government she Hates! She is a dangerous, square jawed, emascualting bully who was already indicted for bullying with Abuse of power. Republicans aren't doing anything to discourage violent behavior; they only defend themselves & go about the business of their ruthless pursuit of absolute power at all costs. "Seven out of ten blame the resources available to deal with people who may be mentally ill as a contributing factor to the shooting"
And the GOP's answer to the problem will be to reduce those resources even further, by cutting all financing to all mental health clinics that cater to the working poor and those on welfare, as we need to cut those "entitlement" programs! And repealing HCR that states mental illness must be treated as an illness. Of course, this will be accompanied by blather stating that "local officials" know best, yeah, like Brewer and her "death panels" that sentence the poor to death by denying them transplants in AZ. Dump them on the street and express horror and how "unimaginable" such a tragedy is the next time it happens? Let'em have their guns. When THEY kill all of US, their taxes will go up. Someone has to pay for the wars, tax cuts for the wealthy, benefits for congress, etc. Where is the story about the man who was a survivor of the shooting and his anti Republican and anti second amendment rants on a radio show Friday or the fact that during ABC's "Townhall" event Sunday he said to the Tea Party paticipant "You will die"??????? The story of all this is that Democrats and people on the left can say vitually anything without so much as a peep from the Media but the same media and the Dems can MANUFACTURE a narritive in which dissagreement with their policies is enough to cause murder and attempted murder. The American people clearly recognize the absolute hypocracy and desparateness of these people and will continue to use the ballot box to demand more honesty from our Govt. and the media. After all of the very thorough, specific and documented evidence has been presented that Jared the mass murderer was confused, sick and hateful, people still believe this was a political message?!?!? This had zero influence on what he set out to do that day. He was a ticking time bomb and these poor people were in the wrong place at the wrong time. Spirited political debate is useful, as long as it stays on point and doesn't degrade into personal attacks. But this crime should not be taken advantage of in the way that some do with their political discussions. It is disrespectful for the victims to ignore the real cause. The polling sounds about right. Nothing is going to change in the longterm, we are all very sad about the shooting and the country is still divided as it has been. As far as guns, sales of handguns are up and will continue to be up in the short term as people feel the need to prepare for personal security because as the polls show we feel like we are on our own if a madman pulls out a weapon. I've been listening to these political pundits and politicians for the last week trying to deviate from blaming anyone. Well, there is plenty of blame to go around when it comes to hate speech. And I can care less of what you say, but I do blame Sarah Palin and I certainly blame Sharon Angle. These to psycho sisters were the ones with the "crosshairs" and "2nd Amendment" remedy theories. Rep. Giffords wasn't the first victim of these two radicals demonization. I recall a congressman's brother in my state having a gas line to house cut and that happened immediately after Sarah Palin posted that target map. So don't give me that crap that they aren't in anyhow responsible for the incivility going on around the country. In Joe Biden's words: "Malarky!!!" What is frustrating to the legacy media is that they cannot blame a right wing nut for the incident, and they are considered part of the problem of the 'heated' rhetoric. And, no matter how hard inter alia Christine Amampour and David Gregory try to link the incident to the supposed violent right wing; they keep getting shut down by the facts; i.e., the guy is deranged, he hated Bush, he wasn't guided by talk radio etc. But, they play down the threat of the left wing nut who threatened violence toward a TEA Partier. Where have we seen and heard of threatened violence and use of violence? By those associated with the left; e.g., SEIU, UAW, AFL/CIO, POTUS, VPOTUS, Emmauel, etc. Yes, there was that incident where a former member of the TEA Party stomped on a woman's head – and there is no excuse for that; i.e., no moral equivalency. Government is NOT the answer to a problem of this nature, because you can't legislate issues away. The sooner the small minds at CNN & other media realize this, the sooner we'll be able to move foward. The killer was an insane person in need of help. Another law about gun control wouldn't have made a difference at all, other than to make it more difficult for law abiding citizens to excercise their 2A rights. Really?? There are some that expect the government ot prevent every insane act by every insane or angry person in this country? Some might argue THAT is an insane expectation. Living and breathing carries associated risks. Deal with it people. This is still remains too funny how the left has spun and continues to spin their political agenda around such a tragic event based on a random act of violence by a psychopath. From Obama's most recent Arizona campaign kick off, I mean the Tuscon bringing the Nation together speech, to the left wing blog machine spinning tales of Sara Palin, Glen Beck and Rush Limbaugh as the Nation's right wing axis of evil....the double standard of hypocrisy from the left remains unfathomable, true to its Solinsky format and directive. It is obvious that none of these people have ever watched Glen Beck or Fox and are more readily glued to a Rachel Maddow spin on MSNBC or as CNN spins left for their masters, Beck nor Fox ever advocates any type of violence and simply presents the information as they see it, in their informed view-port. America is awake and aware of the tricks, the Progressive liberal will soon be out and 2012 will bring a breath of fresh air and new market driven ideas with just the right amount of governmental regulation to make things better. We have seen what giant government expansion does and what a crippling effect it has had on not only our Nation as a whole but in our individual States that have been driven under Democratic governorships. Sorry people but the only blame game in this issue is on the left with no facts whatsoever just lies. Plain, clear and simple. According to a new CNN poll, only a third of all Americans say that Sarah Palin website – which had an image that looked like the crosshairs of a gun marking Gifford's congressional district – deserves a great deal or a moderate amount of blame. That's a lot of people to think this way, and quite rightly so!!!!! I think their should be stricter gun enforcement. I think that a proper class as most states offers and a mental health evalution should be mandatory before a person is allowed to buy a weapon and ammunition. And yes the political rhetoric is partially the blame. Just to blame Sarah is not fair. She is just one of the many out there who have used violent metaphores to push her agenda. Many others as well. No we can't violate free speech but people have to learn that what they say matters, and the person who is soaking up you nonsense may take your words literially. Why add the *not much* category to the whose at fault most section, and then eliminate those *not much* percentages from the narrative? Spin much, CNN? It is fair to say that Sarah Palin is not to blame for the mass murder, but it is also fair to say that her "Crosshairs" web page was one of the most discussting web pages ever used by a reality TV star for personal gain.